He was born in South Kanara, Karnataka. Between 1964 and 1975 Hebbar travelled extensively in Europe. He always wanted to break away from the academic shackles and explore the meaning of creativity through the traditional art forms of India. Studied the illustrations in Jain Manuscripts, Rajput and Mughal miniatures and the murals of Ajanta. Took lessons in Kathak for about two year under the noted Pandit Sunder Prasad, an experience which helped him to infuse rhythm into drawings. As a young boy, he used to draw from memory with anything available like lamp soot and red pebbles ground in gum water, characters from the Yakshagana, the colourful open- air drama of South Kanara which had cast a spell on him. Hebber was always fascinated by the antecedents of a sight and its precincts. In the year 1964, he visited the remains of the Mayan civilization in Mexico. He saw the ruined remains of the temple of the Sun and the Moon once stood. The sight inspired Hebbar to create. 1934-38 Diploma in Painting, J.J. School of Art, Bombay. 1949-50 Academy of Julian (paintings) & cole Estinne (Graphics), Paris. 1941 Exhb., Academy of Fine Arts, Calcutta. 1945 Solo exhb. in Bombay. 1947 Annual Exhb., Bombay Art Society, Bombay. 1949 Solo exhb. in Paris. 1950 Solo exhb, in London. 1951 Salon de Mai, Paris. 1953 All India Exhb. of Paintings and Sculptures, travelling to USSR, Poland and West Germany. 1955 Participated in the Venice Biennale, Italy. 1956 National Exhb., Rabindra Bhavan, Lalit Kala Akademi, New Delhi. 1957 National Exhb., Rabindra Bhavan, Lalit Kala Akademi, New Delhi. 1958 National Exhb., Rabindra Bhavan, Lalit Kala Akademi, New Delhi. 1959 Participated in the Sao Paulo Biennale, Brazil. 1964 Solo exhb. in New York. 1969 Exhb., Bonythan Art Gallery, Australia. 1971 Retrospective, Rabindra Bhavan, Lalit Kala Akademi, New Delhi. 1987 Indian Drawing Today, Jehangir Art Gallery, Bombay. 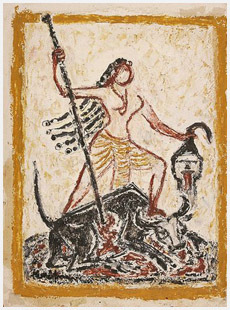 1994 Solo exhb., Vadehra Art Gallery, New Delhi. 1999 Exhb., Fine Art Company, Bombay. Government Museums: Punjab, Karnataka, Tamilnadu, Baroda. Academy of Fine Arts, Calcutta. Birla Academy of Fine Arts, Calcutta. Museum of Modern Art, Paris. Government Museums: Poland, Czechoslovakia, U.S.S.R., Dresden Gallery, Germany. The Staten Island Institute of Arts & Science Museum, U.S.A.
1941 Gold Medal of the Academy of Fine Arts, Calcutta. 1947 Gold Medal of the Bombay Art Society. 1954 Nominated as Eminent artist by the Lalit Kala Akademi in its first General Council meet. 1956 First Bombay State Art Award. 1956 National Academy of Art Award, Lalit Kala Akademi, New Delhi. 1957 National Academy of Art Award, Lalit Kala Akademi, New Delhi. 1958 National Academy of Art Award, Lalit Kala Akademi, New Delhi. 1961 Awarded Padmasri, by the President of India. 1976 Elected Fellow, Lalit Kala Akademi, New Delhi. 1976 Honorary D. Litt. from Mysore University. 1983 Soviet Land Nehru Award. 1980-84 The President of India nominated him the Chairman of Lalit Kala Akademi, New Delhi. 1985 Karnataka Lalit Kala Akademi Award for Distinguished Artists. 1986 Karnataka State Rayotsava Award. 1988 Maharashtra State`s Gaurav Puraskar. 1989 Awarded `Padma Bhushan`, by the President of India. 1990 Maharashtra Shasan `Gourav Puraskar`. There are three fairly clear styles of drawings, in the work of Hebbar. First, there is an immediacy, which brings the things seen. Then there are drawings in which the line twist and turns along with the passing stream of experience. Lastly the lines gropes around the curves, circle, sharp thrust, as though lit by casual flares of perception and begins to breath its own strange kind of life. According to him drawing means a rhythmic expression of a dot in movement. During the course of its movement the form so created may express a sentiment, an emotion of struggle, sorrow or joy. The lyricism and soothing quality of Indian music, the grace and rhythmic quality Indian dance both folk and classical, inspired him to express my feelings in line and colour.